Until now, the only certification body that could issue certificates that are accepted in Japan was the Technology Institute for Industrial Safety (TIIS). CML has successfully operated under an agreement with TIIS that enabled CML’s own test data to be accepted by TIIS for certification. Due to new regulations, this agreement and all other TIIS agreements come to an end on 31st March 2017. Following this change to the Japanese Industrial Health and Safety regulations, and a rigorous application and review process by MHLW, CML is now the sole overseas recognised body under the new regulations. 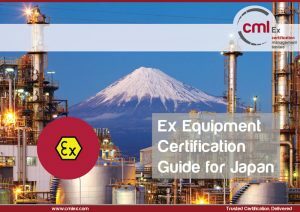 We can offer Ex certification valid in Japan, without the need for further certification or review by local government agencies or certification bodies. Due to regional differences in certification methods, the laws in Japan, translation requirements and the time zone difference, many companies have found the Japanese certification process time consuming and complex and have excluded Japan from their export marketing plans. Some companies may be unfamiliar with the requirements written into the law, when compared with the IECEx System, ATEX, or North American requirements. In the past, this process could often take several years, be a significant burden to administer, and cost much more than originally budgeted. With CML as the first foreign recognised inspection body, we can provide a bridge to Japan, help you through the requirements and explain the differences. The certification requirements are detailed in Japanese law in a way that is different to the broad principles of EU directives. For example, the specification of a product which can be considered a different type, because it must undergo specific tests, would result in the product type appearing on a different certificate. Are there any other regulatory requirements for my product? What protection methods are covered? Is there a quality audit requirement? My equipment has a bought in component, is this a problem? I already have an IECEx certificate, will additional testing be involved? We would be happy to tell you how easy it is to get your Ex equipment certified for export to Japan.